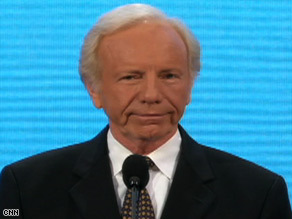 Sen. Joe Lieberman is a former Democratic vice presidential candidate who supports John McCain. Lieberman: Thank you so very much for that warm welcome. You'd have to be me to know how much it appreciate -- I appreciate it. I'm really honored to be here tonight. Dear friends, as you well know, we meet tonight in the wake of a terrible storm that's hit the Gulf Coast, but that really hurts all of us, no matter where we live, because we are all members of our larger American family. Right? At times like this, we set aside all that divides us, and we come together to help our fellow Americans in need. The last thing we think about is whether one of the victims was a Democrat or a Republican, because we're all Americans. You know, the sad truth is that it shouldn't take a hurricane to bring us together like this. Every day...Every day across our country, millions of our fellow citizens are facing very big and real problems. They're worried about their homes and their jobs, their businesses. They're worried about the outrageous cost of gasoline and health insurance, and they are worried about the threats from our enemies abroad. But when they look to Washington, all too often they don't see their leaders coming together to tackle these problems. Instead, they see Democrats and Republicans fighting each other, rather than fighting for the American people. I don't have to tell you that we were blessed in this country to have a great generation of founders. And they foresaw the danger of this kind of senseless partisanship. In fact, our first president, George Washington, in his farewell address, warned that the spirit of party could be the worst enemy of our democracy and enfeeble our government's ability to do its job. My friends, I think tonight we can say that President Washington was absolutely right. The truth is, today we are living through his worst nightmare in the capital city that bears his name. And that brings me directly to why I am here tonight. What, after all, is a Democrat like me doing at a Republican convention like this? Well, I'll tell you what: I'm here to support John McCain because country matters more than party. I am here tonight for a simple reason. John McCain is the best choice to bring our country together and lead America forward. And, dear friends, I am here tonight because John McCain's whole life testifies to a great truth: Being a Democrat or a Republican is important, but it is nowhere near as important as being an American. I think you know that both of the presidential candidates this year have talked about changing the culture of Washington, about breaking through the partisan gridlock and the special interests that are poisoning our politics, but, my friends, only one of them has actually done it. Only one of them has shown the courage and the capability to rise above the smallness of our politics to get big things done for our country and our people. And that one is John S. McCain. You know John, and you know that he understands that it shouldn't take a natural disaster like a hurricane to get us to take off our partisan blinders and work together to get things done. It shouldn't take a natural disaster to teach us that the American people really don't care much if you have an "R" or a "D" after your name. What they care about is, are we solving the problems they're against every day? Let me tell you. What you can expect from John McCain as president is precisely what he's done this week: Put our country first. That's not -- that's not a political posture by John. That's the code by which he has lived his entire life, and that is the code that he will carry with him into the White House next January. Now, let me tell you that I've had the privilege of serving with John for almost 20 years and the honor of becoming a dear friend of his. I've personally seen him over and over again bringing people together from both parties to tackle our toughest problems, for example, to reform our campaign finance laws, our lobbying and ethics laws, to create the independent 9/11 Commission after that great natural disaster -- that great unnatural disaster caused by the terrorists, and then to work to pass the national security reforms that have made every American safer since then. And then he worked together to end the partisan paralysis over nominations to the Supreme Court and other federal courts. This is the record. Now, let me share something with you that I'm in a unique position to do as a Democrat. My Democratic friends know all about John's record of independence and accomplishment. And you see, that's why I think some of them are spending so much time and so much money trying to convince the American people that John McCain is someone else. I am here to tell you what I think you know, but I want to speak to the people out there. Don't be fooled by some of these political statements and advertisements. Trust me: God only made one John McCain, and he is his own man. Let me, as John would say, give you some straight talk here. If John McCain was just another go-along partisan politician, he never would have taken on corrupt Republican lobbyists, or big corporations that were cheating the American people, or powerful colleagues in Congress who were wasting taxpayer money. But he did. If John McCain was another go-along partisan politician, he never would have led the fight to fix our broken immigration system or actually do something about global warming. But he did. As a matter of fact, friends... if John McCain is just another partisan Republican, then I'm Michael Moore's favorite Democrat. And I'm not. And I think you know that I'm not. Sen. Barack Obama is a gifted and eloquent young man who I think can do great things for our country in the years ahead, but, my friends, eloquence is no substitute for a record, not in these tough times for America. In the Senate, during the 3½ years that Sen. Obama has been a member, he has not reached across party lines to accomplish anything significant, nor has he been willing to take on powerful interest groups in the Democratic Party to get something done. And I'd just ask you to contrast that with John McCain's record of independence and bipartisanship, but let me go one further. And this may make history here at this Republican convention. Let me contrast Barack Obama's record to the record of the last Democratic president, Bill Clinton, who stood up to some of those same Democratic interest groups, worked with Republicans, and got some important things done, like welfare reform, free trade agreements, and a balanced budget. Now, I'm honored to say just a word about the great lady that John McCain has selected as his running mate. Gov. Palin, like John McCain, is a reformer. She's taken on the special interests and the political power-brokers in Alaska and reached across party lines to get things done. The truth is, she is a leader we can count on to help John shake up Washington. That's why -- that's why I sincerely believe that the real ticket for change this year is the McCain-Palin ticket. Let me tell you, friends, that the Washington bureaucrats and the power brokers are not going to be able to build a pen that will hold in these two mavericks. It's just not possible. Together, I think we can count on John and Sarah to fight for America and to fight for you, the American people. And that's what our country needs most right now. We all know it: These are tough times here at home, and we have dangerous enemies in the world. And what America needs now, frankly, is not more party unity. What we need now is more national unity. And this is especially true, of course, because we are a nation at war. We need a president we can count on to fight for what's right for our country, not only when it's easy, but when it's hard. And I was there, so I can tell you, when others were silent about the war in Iraq, John McCain had the guts and the judgment to sound the alarm about the mistakes we were making in Iraq. You know... when others wanted to retreat in defeat from the field of battle, which would have been a disaster for the USA, when colleagues like Barack Obama were voting to cut off funding for our American troops on the battlefield, John McCain had the courage to stand against the tide of public opinion, advocate the surge, support the surge, and, because of that today, America's troops are coming home, thousands of them, and they're coming home in honor. My -- my friends, I have had the privilege and I'd say the pleasure of traveling the world with John McCain, even with Lindsey Graham it was a pleasure. But I speak of John and I say that I can tell you from these travels how much he's respected, and admired, and liked by leaders across the globe. John McCain will be a president our allies will trust and our enemies will fear. And that's the kind of president we need in today's world. My friends, before I conclude, I want to ask the indulgence of all of you here in this hall tonight, because I want to speak directly to my fellow Democrats and independents who are watching or listening tonight. I want to -- I want to speak directly to you out there. I know many of you are angry and frustrated by our government and our politics today, and for good reason. You may be thinking of voting for John McCain, but you're not sure yet. Some of you may never have voted for a Republican before. And, frankly, in an ordinary election, you probably never would. But I want you to believe with me that this is no ordinary election, because...And it's no ordinary election because these are not ordinary times. And trust me: John McCain is no ordinary candidate. You may not agree with John McCain on every issue, but you can always count on him to be straight with you about where he stands and to stand for what he thinks is right for our country, regardless of the politics. I can tell you with a certain faith that as president you can count on John McCain to be what he is naturally, a restless reformer who will clean up Washington and get our government working again for all of the American people. So, tonight, I want to ask you, whether you are an independent, a Reagan Democrat, a Clinton Democrat, or just a plain-old Democrat, this year, when you vote for president, vote for the person you believe is best for our country, not for the party you happen to belong to. I ask those of you who are watching or listening, vote for the leader who, since the age of 17, when he first raised his hand and took an oath to defend and protect our Constitution, has always put America first. My friends...I appeal to independents, Democrats, and Republicans. Let's come together this November to make a great American patriot, John McCain, our next great president. Thank you. God bless you, and God bless America.